It’s one of the closest galaxies to Earth, but the Carina Dwarf Galaxy is so dim and diffuse that astronomers only discovered it in the 1970s. A companion galaxy of the Milky Way, this ball of stars shares features with both globular star clusters and much larger galaxies. 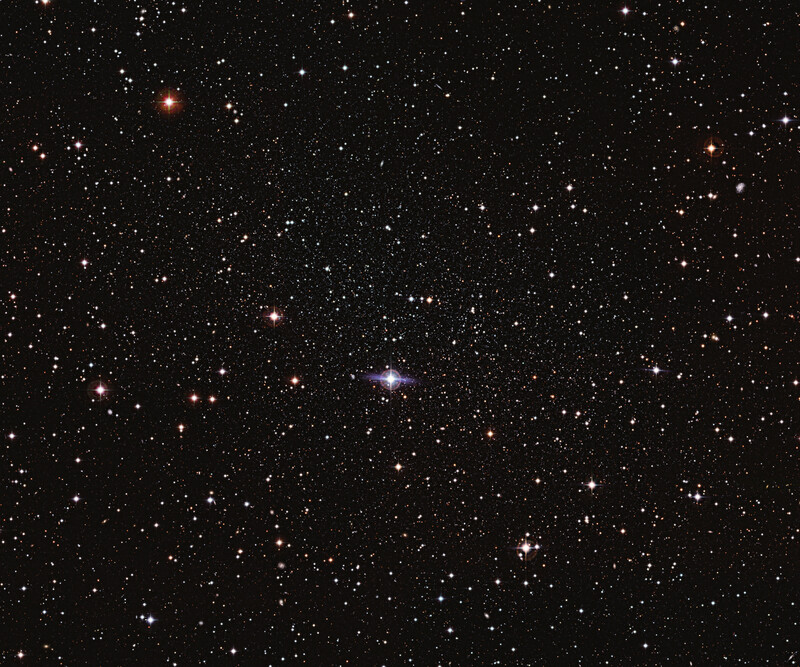 Astronomers believe that dwarf spheroidal galaxies like the Carina Dwarf are very common in the Universe, but they are extremely difficult to observe. Their faintness and low star density mean that it is easy to simply see right through them. 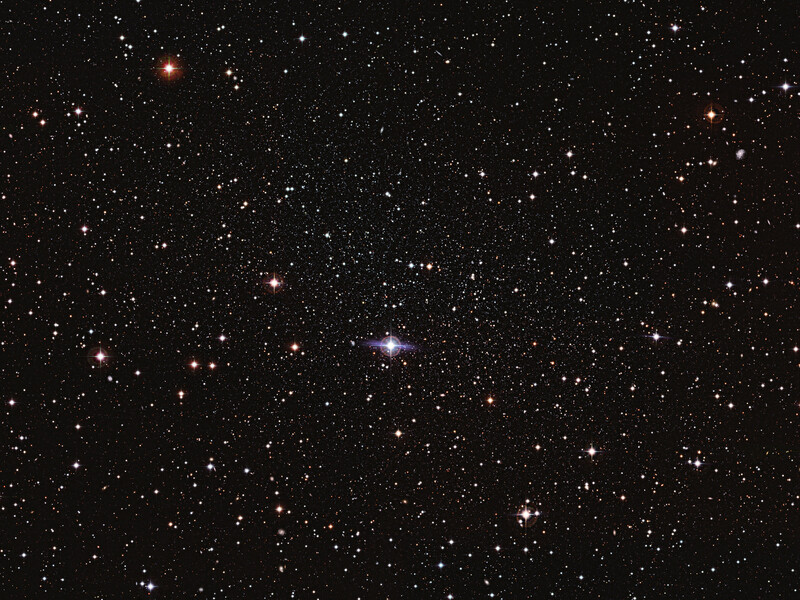 In this image, the Carina Dwarf appears as many faint stars scattered across most of the central part of the picture. 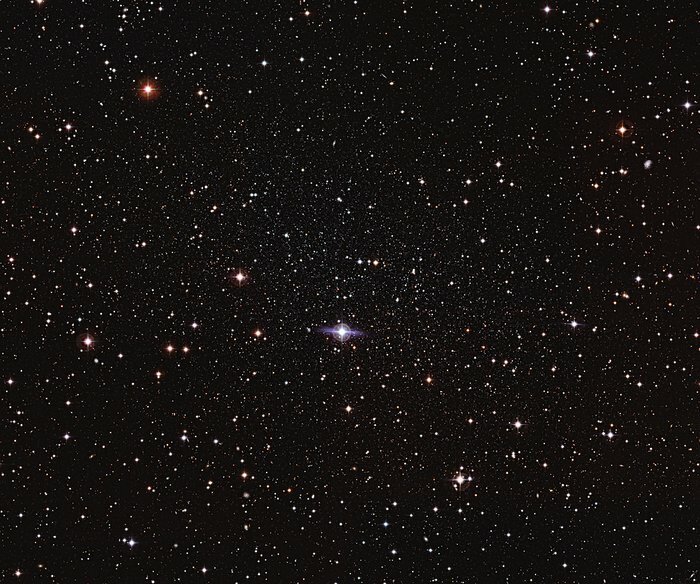 It is hard to tell apart stars from the dwarf galaxy, foreground stars within the Milky Way and even faraway galaxies that poke through the gaps: the Carina Dwarf is a master of cosmic camouflage. The Carina Dwarf’s stars show an unusual spread of ages. They appear to have formed in a series of bursts, with quiet periods lasting several billion years in between them. It lies around 300 000 light-years from Earth, which places it further away than the Magellanic Clouds (the nearest galaxies to the Milky Way), but significantly closer to us than the Andromeda Galaxy, the closest spiral galaxy. 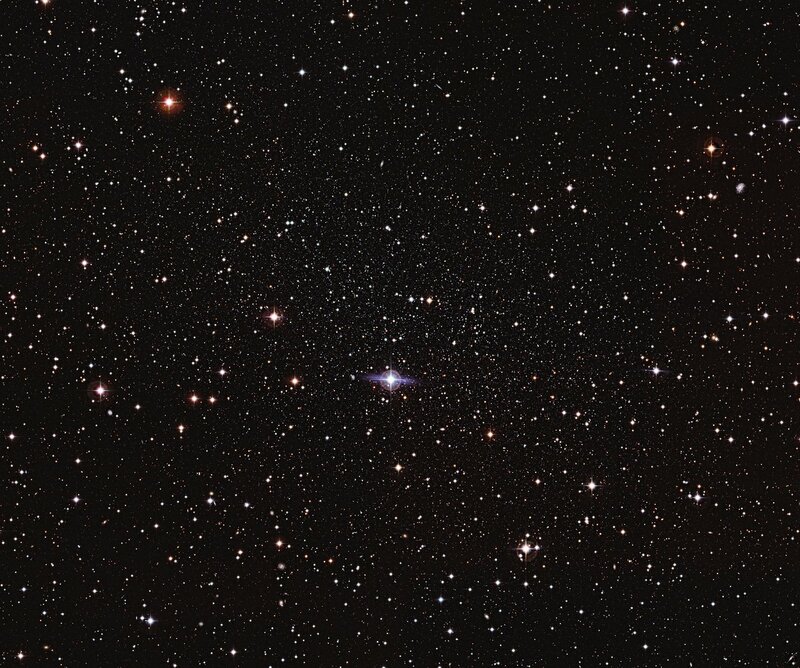 So, despite being small for a galaxy, its proximity to Earth means that the Carina Dwarf appears quite large in the sky, just under half the size of the full Moon — albeit very much fainter. This makes it fit comfortably within the field of view of ESO’s Wide Field Imager, an instrument designed for making observations of large parts of the sky. 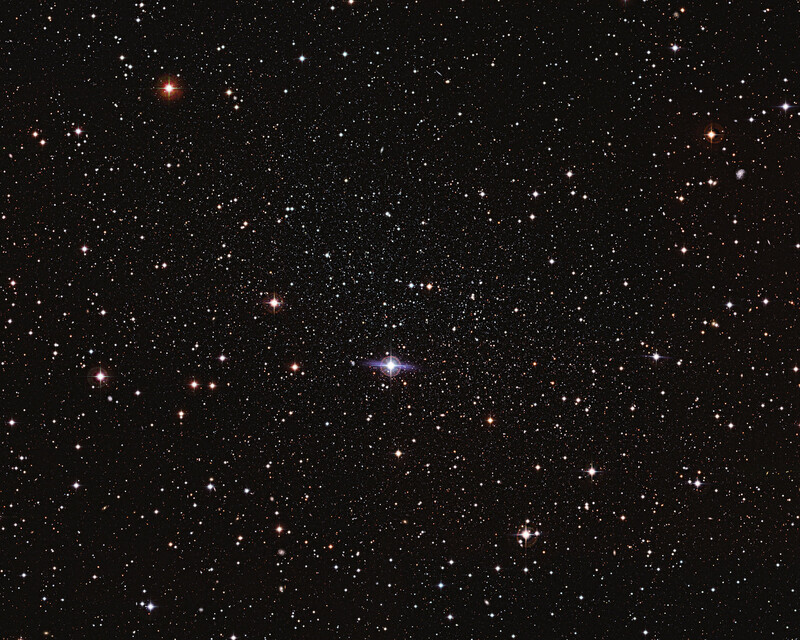 Although this image in itself is not so striking, it is likely the best image of the Carina Dwarf Galaxy to date. 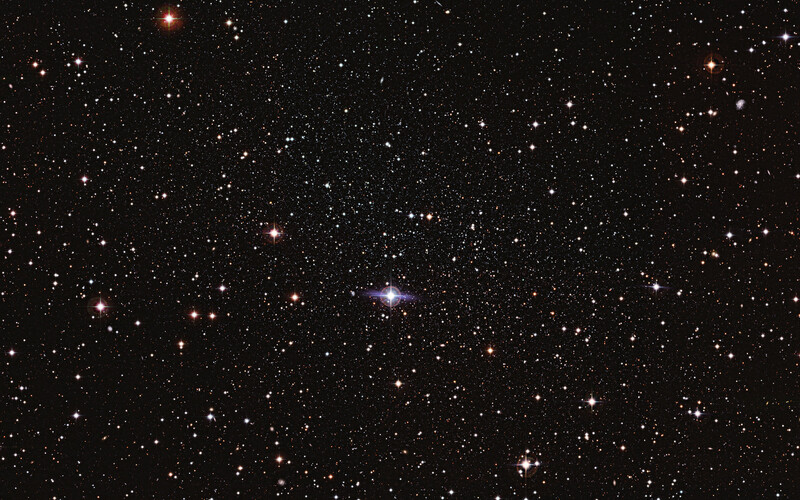 The image was made using observations from the Wide Field Imager on the MPG/ESO 2.2-metre telescope at La Silla, and from the Victor M. Blanco 4-metre telescope at the Cerro Tololo Inter-American Observatory. Position (Dec): -50° 57' 58.86"